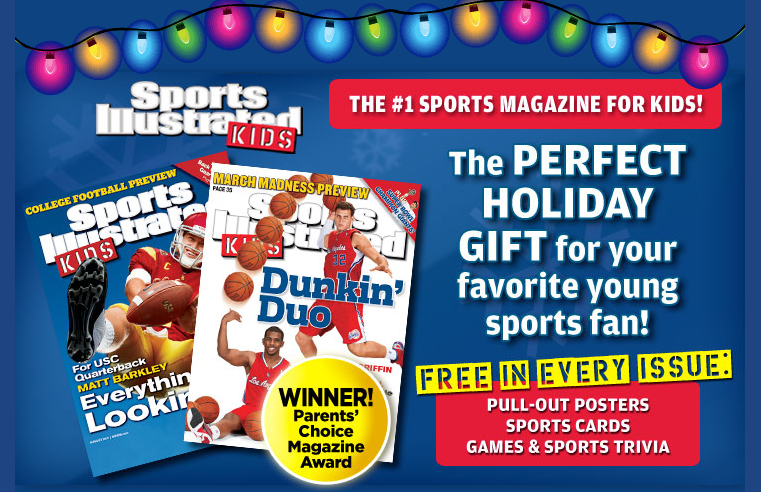 Give the Gift of Sports Illustrated KIDS! The holiday season is coming up quickly and you are probably starting to make your lists. If you have a sports lover on your list, I have the perfect AFFORDABLE gift idea for you today! SPORTS ILLUSTRATED Kids is THE magazine for boys and girls who love sports. It presents sports the way kids want to read about them: with great action photos, easy-to-read stories about star athletes, helpful instructional tips from the pros, and humor, comics, and activities. SI Kids is a great way to encourage kids to read, and it has won highest honors from the Association of Educational Publishers and the Parents' Choice Award. Best of all, they are offering a Special Offer this holiday season! Receive an entire year of SI Kids in print and on tablet for only $19.95! Need more reasons to give the gift of SI Kids this season? Reason #1: It’s the perfect stocking stuffer. Reason #2: It promotes reading for children who are reluctant readers. Reason #3: Each issue is full of exciting stories, photos and games that are a perfect distraction while traveling. Reason #4: No gift wrapping – it’s delivered straight to your door. Reason #5: It’s the gift that keeps on giving the whole year through. And don’t forget – take advantage of this great offer by subscribing HERE.